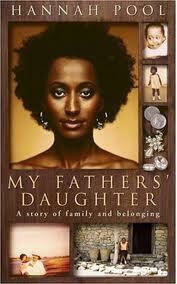 My Fathers' Daughter by Hannah Pool is a personal memoir of raw, emotional power. Originally born in Eritrea, Hannah was placed in an orphanage after her mother died during her birth. She was adopted at six months old by David Pool, a British academic, and she eventually joined him in England where she grew up in Manchester. It was when she received a letter from her brother in Eritrea, while still at university, that she finally discovered her birth father was alive and that she had a family of brothers, sisters, aunts, uncles and cousins. But it was ten years before Hannah finally got a chance to meet a cousin who was living in London. That meeting proved to be the catalyst for arranging a visit to meet her Eritrean family. Pool writes with searing honesty: about her conflicting sense of anger and guilt, towards both of her fathers; the duality of not fully belonging in either culture; the overwhelming sense of paralysis in the face of an emotional reunion; and with the bewildering sense of wanting to run away from what she has yearned for all her life. This is powerful and honest. In turns emotional and thought-provoking.